A new UCLA study has found that healthy nonsmokers experienced increased adrenaline levels in their hearts after one electronic cigarette with nicotine. The findings are published in Journal of the American Heart Association, the open access journal of the American Heart Association/American Stroke Association. Unlike cigarettes, e-cigarettes, also known as e-cigs, have no combustion or tobacco. Instead, these electronic, handheld devices deliver nicotine with flavoring and other chemicals in a vapor rather than smoke. The researchers had previously reported that chronic e-cig users were more likely to have signs of two heart risk factors — oxidative stress, which hampers the body’s ability to defend itself against free radicals (a type of particle that has been associated with heart disease) and higher levels of adrenaline in the heart, which can lead to an increased heart rate and high blood pressure. This current study aimed to find out if nicotine caused these events. Middlekauff and her team used a technique called “heart rate variability” obtained from a prolonged, non-invasive heart rhythm recording. Heart rate variability is calculated from the degree of variability in the time between heartbeats. This variability may be indicative of the amount of adrenaline on the heart. Previous studies have used a heart rate variability test to link increased adrenaline activity in the heart with increased cardiac risk. People with and without known heart disease who have this pattern of high adrenaline levels in the heart have increased risk of death, Middlekauff said. In the first study to separate the nicotine from the non-nicotine components when looking at the heart impact of e-cigarettes on humans, researchers studied 33 healthy adults who were not current e-cigarette or tobacco cigarette smokers. On different days, each participant used an e-cigarette with nicotine, an e-cigarette without nicotine or an empty device. Researchers measured cardiac adrenaline activity by assessing heart rate variability and oxidative stress in blood samples by measuring the enzyme plasma paraoxonase. Exposure to e-cigarettes with nicotine, but not e-cigarettes without nicotine, led to increased adrenaline levels to the heart, as indicated by abnormal heart rate variability. Oxidative stress, which increases risks for atherosclerosis and heart attack, showed no changes after exposure to e-cigarettes with and without nicotine. The number of markers they studied for oxidative stress were minimal, however, and more studies are warranted, Middlekauff said. Middlekauff said it was reassuring, however, that non-nicotine components do not have an obvious effect on adrenaline levels in the heart. 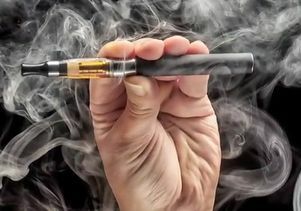 Future studies should look more closely at oxidative stress and e-cigarette use, using a broader number of cardiac markers and in a larger population of people, researchers said. Co-authors are Roya Moheimani; May Bhetraratana; Kacey Peters; Benjamin Yang; Fen Yin; Jeffrey Gornbein and Dr. Jesus Araujo, all from UCLA. Author disclosures are listed on the manuscript. The study was funded by the Tobacco-Related Disease Research Program; American Heart Association, Western States Affiliate; National Institute of Environmental Health Sciences, National Institutes of Health; Irma and Norman Switzer Dean’s Leadership in Health and Science Scholarship; and UCLA Clinical and Translational Science Institute.